The burger…a simple thing. Ground meat, in patty form, cooked and served on a bun. It’s hard to mess one up, and equally hard to make one that stands out from the crowd. Yet, people manage to do both. How? Let’s start with the criteria by which I judge a burger when looking for something great. The patty – this IS the essence of the burger – so cutting corners here knocks you out of the running for burger greatness. Fresh pressed ground meat, not frozen. Do I really need to explain why fresh is better? Quality of the beef blend. 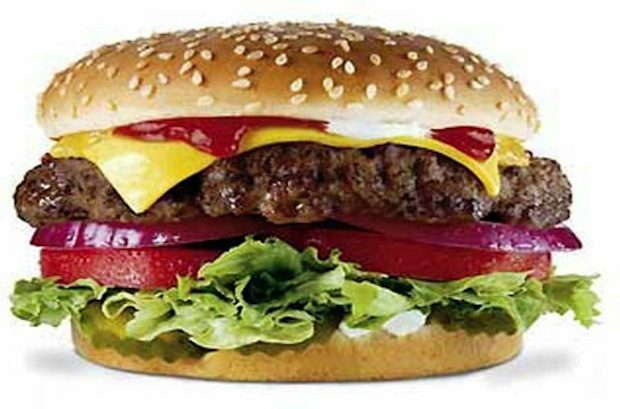 No one wants a greasy burger, but too lean yields a dry, flavorless product. Cooked to order. Let me be clear…medium rare or rare is NOT against the law! Stand for burger freedom; let your customers choose! ~ The bun. It should be able to hold together in a fight between toppings and your grip, yet not so heavy it masks the flavors inside. ~ Veggies and toppings. Fresh! Wilted lettuce and tomatoes past their prime are just criminal. While it is actually a monument to grilled cheese sandwiches, Melt easily takes my #1 spot. They start with a custom blend of ground beef (made for them locally) that makes their patty so good it could stand on its own against a steak. Plus, they take customizing your burger to a new level. If you ask them to put peanut butter and bacon on your burger, then batter dip the whole thing (bun too) and deep fry it, they will. Seriously, they will deep fry anything! I recommend the El Diablo Burger; its ancho and jalapeño chiles help bring the heat! ~ The good: Besides the burgers and crazy sandwiches, Melt has a craft beer selection beyond belief. 30+ on tap, plus all the bottles. ~ The bad: Melt is a victim of its own success; wait times of over an hour are the norm, especially for groups of more than four. I suggest going as couples and sitting at the bar to avoid the wait. With three locations in the Cleveland area, Melt Bar & Grilled is a Cleveland original! Normally, I detest big corporate chain restaurants, but the masterminds behind “The Bucket” go to great lengths to make it feel like a local pub. And it’s kid friendly. Formerly my #1 burger, they do a surprising amount of their menu from scratch, including the burgers. Go for Gary’s Belly Buster, topped with a fried egg. ~ The bad: Honestly, this place is nailing it. Rusty Bucket locations everywhere. Our favorite is on Kruse Dr. in Solon. A homage to the simple from Cleveland’s celebrity chef, B Spot takes the burger to gourmet levels with offerings like the “Porky” topped with pulled pork. Plus, who can resist grown up milk shakes like the Vanilla Bean Apple Pie Bacon with Bourbon! ~ The good: Surprisingly affordable upscale fare. ~The bad: Militantly opposed to customization. No, you may NOT change the cheese on that burger! This local Burton favorite, formerly Cogan’s, keeps busy by sticking to the basics. Simple quality ingredients, prepared well, including the burgers. Sticking to the basics, and doing it well, got them into my top five against some heavy hitting competition. ~The good: One of the only non-frozen burgers in Geauga County, cooked to order. ~The bad: Nothing bad here. Locally owned, back to basics, good quality. JC’s Restaurant is located on the square in Burton. A surprising find in a strip mall in Madison, Burger Joint is a throwback to what a burger joint used to be. They are even custom grinding their own beef blend in-house! ~The good: Both the patties and sautéed “shrooms” are seasoned with a garlic/black pepper blend. ~The bad: Will not cook to order, so no rare or medium rare. Now, whenever anyone gives out an opinion on the top five anything, it’s just fuel for a debate. These are my top five burgers in N.E. Ohio, and 90% of you will disagree.